Vijay Shankar, the talented right-handed batsman from Tamil-Nadu, has been part of India’s squad for quite some time now. The batting allrounder has been in good form of late. He even bowled India to victory in the 2nd ODI between India and Australia at Nagpur, defending 2 wickets when 11 runs were required for the Aussies. In the first innings, he played a crucial knock of 46 runs (41 balls), giving a solid foundation that helped India and Virat Kohli post a formidable total. Shankar is predominantly a top-order batsman who can bowl a few overs. He came into the squad in place of the Baroda allrounder Hardik Pandya, but cannot be actually considered as a like to like replacement for Pandya. However, Shankar hasn’t failed to impress the selectors. In the limited opportunities that he has got, he has made his presence felt as a batsman. He had a decent tour of New Zealand in the 5th ODI and in the T20 series. After a sickening collapse in the 4th ODI in New Zealand where India recorded their biggest ever defeat (in terms of the balls remaining), Shankar was included in the playing 11 for the final ODI to add more balance, and the all-rounder didn’t disappoint. The Indian top order collapsed once again in the 5th ODI and was reeling at 18-4. The Tamil Nadu batsman walked in at number 6 and showed great composure and match awareness on a spicy pitch, helping India post a formidable total. Ever since the Nidahas trophy, Shankar has worked really hard on his game and has buried the ghosts from the final of that T20 tournament. He had a great 2018 with India A squad and has powered the sides to victories in NewZealand and Australia for the India-A side. He was the highest run scorer in the NewZealand A tour and he hasn’t looked back ever since. For all the abilities Shankar possess, one must understand that Hardik is a perfect allrounder in the side and is most suited at number 7 than Shankar. Also, Hardik can consistently give Virat 6-8 overs at a decent economy. Coming over to Ambati Rayudu, the Hyderabadi batsman recently retired from first-class cricket to focus on limited overs cricket. The move certainly hasn’t helped him, as he is caught out of match practice. He has lacked to show consistency in the opportunities he has got so far. In the 3 ODIs against Australia, Ambati Rayudu has failed to make an impact. The 3rd ODI was a perfect opportunity for the Hyderabadi batsman to stamp his authority in the playing eleven. Unfortunately, Rayudu failed. He misread the incoming delivery from Pat Cummins and was bowled right through his gate. 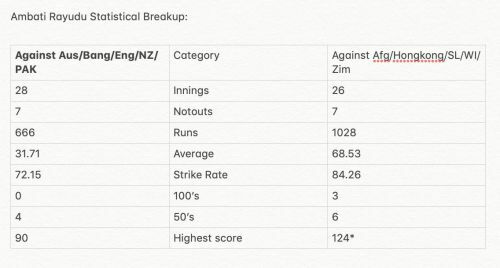 If we breakdown Rayudu’s statistics, the numbers are disturbing. As evident from the below table, Rayudu has failed to perform well against top quality sides. His average is a mere 31 against the top sides while he averages 68.21 against the tier-2 teams. So one shouldn’t be fooled by his career average of 49. Rayudu has undoubtedly struggled to do well on pacy tracks and having him at number four could be a risk in England at the World Cup. 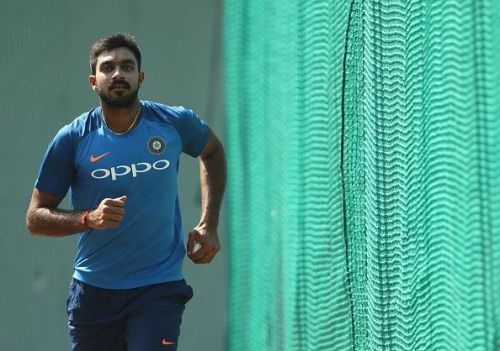 Rayudu will still be on the flight to England, but India should consider Vijay Shankar to solve the middle muddle that the team is facing from the past couple of years now. With Vijay at 4, and Kedar Jadhav and Hardik Pandya at 6 and 7 respectively, it gives Virat seven bowling options and much more solidity and stability to the batting lineup. India plays its last two ODIs against Australia before its World Cup campaign begins and it is a perfect opportunity to try out the new combinations. India begins its World Cup campaign on the 30th of May against South Africa at The Rose Bowl in Southampton.